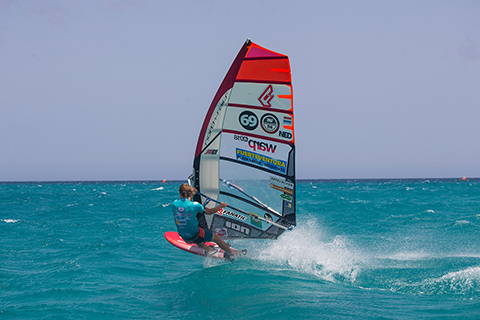 Chop, it’s part of windsurfing whether you like it or not, and how to deal with it is a challenge almost all sailors have to face. 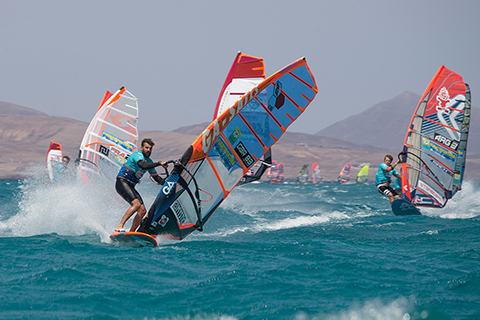 Slalom racing at Sotavento is one of the most extreme chop scenarios in windsurfing, John Carter asks the racers who fly over it on the brink of control for their tips on how to keep board and sail in check and Finn Mullen finds out from RRD, Gaastra and Tabou on the design tweaks for chop management. As I have said many times you need to be comfortable to survive heavy chop. If you are comfortable then you are faster. If you just search for speed you will struggle for sure and when you are on the edge of control you will actually lose speed compared to a sailor who is in control. I try to make my sail softer. This allows your body to stay still and it is the sail that is moving. If the equipment is stiff then you have to move with it. A softer sail is better in choppy conditions. You don’t want the sail too flat or it will move too much; it is a balance. If you feel you are flying away then move the mast track forward, which may make the board stickier, but if you hit a strong gust you won’t fly away. The body is like suspension in chop. I use really long harness lines because of that so that your legs are free to move a lot. 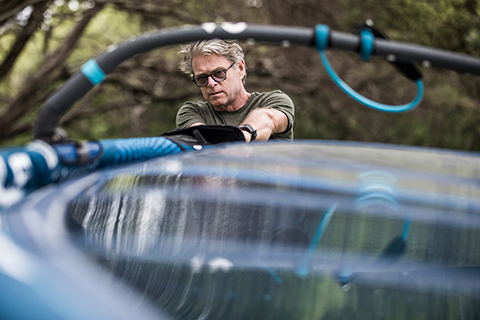 I use 32 plus harness lines as they make it easier to hold on in rough conditions. My advice is make sure your gear is comfortable; sometimes a slightly bigger fin than what you would normally use can help, also a smaller sail and larger board. Everyone suffers in chop, especially when you are pushing the limits during racing. 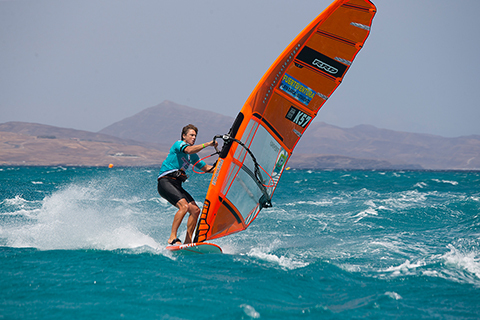 In Fuerteventura the first reach is the choppiest because it tends to be the broader one. The windier it is, the worse it gets. When we design a race sail we are looking for the maximum performance in many aspects – power, top end speed, acceleration, but also a certain degree of manoeuvrability to jibe around the marks. So it is clear we are talking about a compromise. Water is never completely flat, a certain amount of waves and chop is always present and in spots like Sotavento it can be extreme for racing. So in the compromise of performance we have to mix also some features to self-adapt to these stresses that continuously try to make you lose control. The principal way we get this is with finding the perfect match between sail luff curves and mast bending curves so to get some kind of shock absorbing behaviour of the rig. When you hit chop you don’t want to get airborne and completely lose control, your sail/mast combination’s twists and flexes should release the excess power keeping you on track. Another basic feature in the sails to cope with that is the top being flat and loose and the bottom having most of the shape, this keeps the centre of effort low and aids control a lot. All these features help, but a grand part of the job is also done by the sailor who responds to the impacts, absorbing them mainly with their legs. I always think that boards/sails/fins and even settings must be as simple as possible. If a pro rider has to spend an hour tuning, it makes no sense and will be even worse for the final customer! For sure there is always some products that perform a bit better on flat water than on chop or vice versa but, as often confirmed in match testing, when a product is good, it is good almost everywhere. So it is our job to really know where the limit is and push the testing in a good direction and not too much towards radical options. 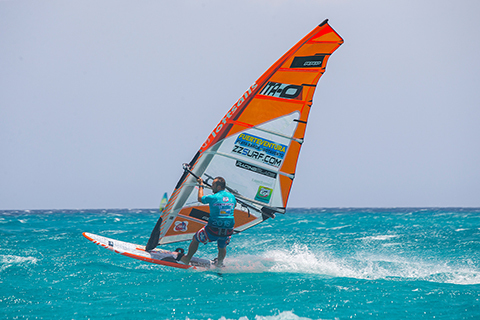 So for me, the priority during testing a full on slalom board or even a freeride board, is that the board will naturally sail ‘easy’ over chop, or in ‘hard’ sailing conditions. If this test is fine, the test on flat water will 99% of times be a success also. Without control it is impossible to go fast anyway. As a rider, for my personal settings, I don’t change anything in terms of size of fins or sail tension whatever the conditions are. I just move the mastfoot forward around 1 cm, and also sometimes my stance with front footstraps 1 or 2 cm forward also, just to be sure that if I touch some crazy chop out of nowhere my gear will stay flat, keep going forward and not launch to the moon! The easiest thing to do is drop your boom down a bit, which helps to get your gear more controllable. I extend my lines as well. Drop the boom, extend the lines and then sit a little more over the top of the board; I kind of squat down in my stance to keep it under control. I like it when conditions are rough and choppy. It gives me a chance that others will make more mistakes. When it gets really windy a lot of people have a tendency to put loads of downhaul on to kill the power of the sail. When you do that the head is really open and the board does not stay in the water and bounces. 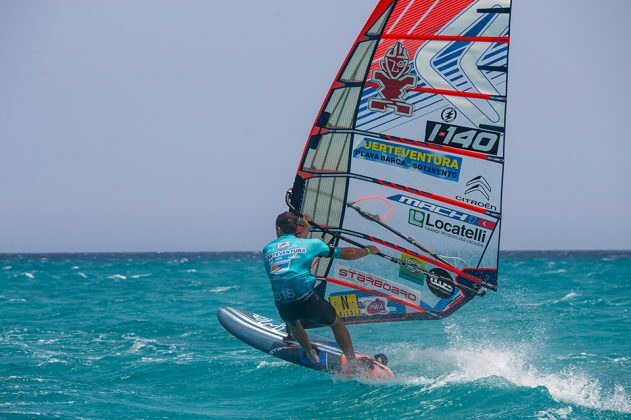 Although you kill a bit of power from the sail, you lose all the control from the board. From a design point of view, getting a sail working well in chop is pretty tricky, especially in somewhere like Sotavento. The basics are all about getting the right balance of downforce (which pushes the board down), and lift and having the board free. There are various ways to achieve this, but a lot comes from the head of the sail. If its very open at the top, the board will fly nicely, whilst if it’s more closed it will push the board down and give you control. A lot of this is in the design of the sail, but it can also be tuned. Often half a cm more downhaul will make the board lift and fly better, or taking off half a cm will have the board pinned to the water, so at the top level it’s all about finding that balance. In Fuerte’ I always have trouble finding the balance between coming in and going out. Coming in you are going over the back of the chop and really you want the board flying with the nose up. Then heading out to sea it’s the opposite. The board is constantly flying away and you are looking for downforce to control it. So getting the balance is really tricky. Normally I aim to get it best coming in, which is the all-important first reach, and then on the way out I hang on and deal with it! Sotavento is indeed one of the most challenging venues in the PWA. Sailors are fighting chop and some swell on the first leg coming back to the beach and then receive extremely hard chop on the way out after jibing around the inside marks. Sometimes you feel the board is actually going to snap in half (this has happened before). With our small boards control and comfort has become as important, or even more important, then the top speed and the board needs to be incredibly easy when it comes to jibing. 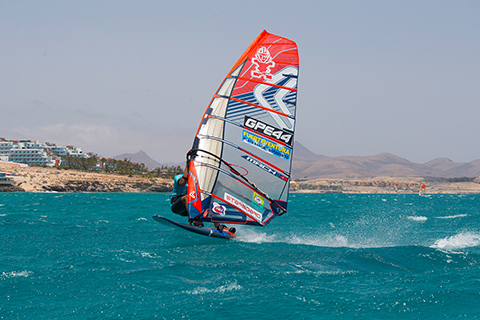 The RRD X-FIRE 98 is the board most used by RRD team riders when it comes to strong winds in Fuerteventura. Compared to bigger boards, the outline of the small boards is a bit rounder, the rocker is a bit higher to go over the chop and waves and vee on the bottom is increased to help absorb the chop and waves. The tail has a deeper cut along the side of the board, which helps to keep the amount of control needed. If a sailor is comfortable in 30 knots of wind then he is most probably going to be fast. Don’t use too big a sail as a bigger sail is heavier on the board and you will feel the chop more. If you have too small a fin you can get some ‘spin out’ between the chop. The best is to have a soft sail and not use too stiff a mast. That is it. I look at every piece of chop ahead of me so I am ready to react with my legs. I plot my course through the water if I can. I use my legs like the suspension on a motocross bike. You also need to see the gusts coming as well as the chop in front of you and the guys around you. If you enter a big piece of chop you need to release a little bit of power to pass through, then after that you need to put the power back on. Fuerteventura is definitely a hard place to get tuned up for due to the heavy chop, that’s why I always go at least one week earlier to get used to the chop again! So tip one is preparation! During the week it’s finding the balance between having enough lift to pass the waves, but not too much as in a strong gust your board can fly away. I always make sure that my board is loose on the water and I keep control by lowering my boom a little bit compared to other spots. I think being a bit heavier helps for choppy conditions, so off the water I’m going to the gym a lot lately to get my weight solidly above 90 kg. Mostly I’m doing weight lifting, it’s time for me to grow some more muscles! You have to go full speed in chop. Going too slow is way worse. I am a victim to that because I get scared and every time I let off because I am scared I actually injure myself or crash! You just have to get it out of your head and try to go full speed every time. The boards are much better these days for choppy conditions. We have worked on this in our development to make them much easier to sail in chop. When it is choppy put your boom a bit lower and the mast track a bit more forward. Also in these conditions if you don’t go full power you feel the chop more and more. I think this is the difference between the top guys now and the rest of the fleet. 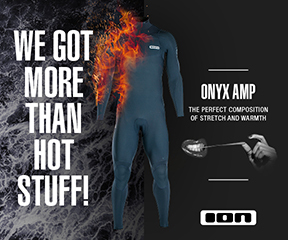 In the strongest conditions you need to be able to go full power. If you cannot sail like this it is much harder. You need also to switch your brain a bit to this mentality. I am not afraid by my speed, it is more the other guys around me. Look what happened in Fuerteventura last year with Taty Frans. I know if I go at full speed, personally I am in control. But the people around me I am not sure about the control they have. 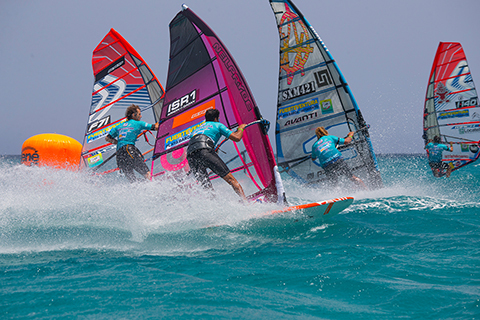 Racing in choppy waters is one of the biggest challenges you can encounter when slalom sailing. The feeling is you are going to get catapulted every second, and are constantly out of control. Extreme conditions like in Sotavento is something that I really enjoy. It’s technical, and you need to be well tuned to go fast. Tuning your equipment for choppy waters is different to flat water. 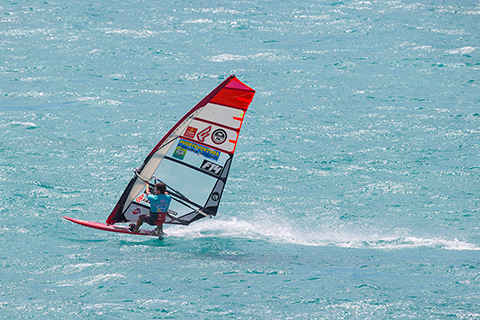 You can put your mastfoot a bit more forward on the board, and your sail with a bit more downhaul tension, and if the feeling is still out of control, you can put your boom a bit lower and lengthen your harness lines. Off the water, I always like to stretch and do balance exercises, I feel keeping the body loose helps in gybes and to control your board. Basically all the places we go for racing have their own particular conditions, where you have to adapt your gear and yourself. 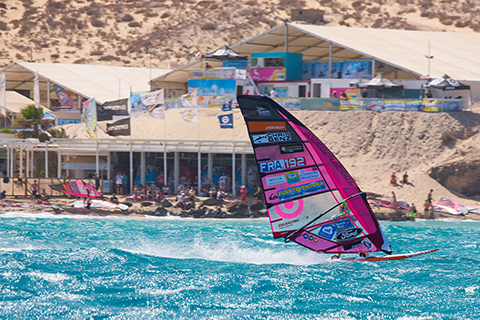 Fuerteventura particularly is one of the hardest places for racing and tuning. From outside it looks super flat, but in reality the chop is pretty bad and combined with the wind angle makes it super difficult to race in. You need a board that flies over the deep chop on the way back to the beach, but once you jibe you need a board that stays down as much as possible to have control on the fully downwind leg. I generally have two boards and I choose the larger one and use the footstraps to trim it. I use the RRD X-FIRE 98 and I put on starboard tack the wider stance and on port tack I move the back footstrap one hole in front. The track position it depends a lot on the sail and the boom height, 135/133 cm from the tail are generally the positions I use. Remember if you use a lot of downhaul you will have to move the mastfoot a bit forward. The same if your sail is very open in the top and the opposite if it is closed. For fins I use Zed SLM 32/31 for 7.0m down to 5.6m sail sizes. I use Loftsails Racing Blade sails with the softest masts I have. You need control and the sail to absorb the chop to maintain good speed. On small sails 6.3m to 5.6m I use both of the outhaul holes to have more softness and a more open lower leech to give higher speed. For the boom I use a setup that allows me to have the maximum control. Boom very low, like in the third bottom part of the cutout and harness lines around 34 to 36 cm. The more the wind and smaller the sail, the lower the boom and longer the harness lines. For physical training I try to work a lot on aerobic fitness. You need lots of oxygen when you arrive at that fourth buoy and you want to try to go inside someone! Also power on the back leg for the fully downwind legs! I really enjoy high wind sailing, even if I don’t get to sail these conditions much at home. The adrenaline is twice as much as normal slalom because you have to be aware of more parameters as a crash can come really quickly. 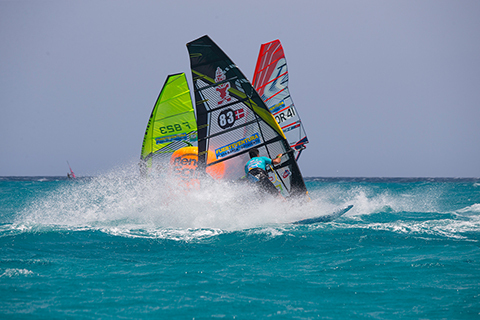 It’s exciting to race in strong wind conditions because everybody is on their limits, you think you are close to death, but at the end of the race when you come back to the beach and you talk with the other guys it’s the same for them as well. 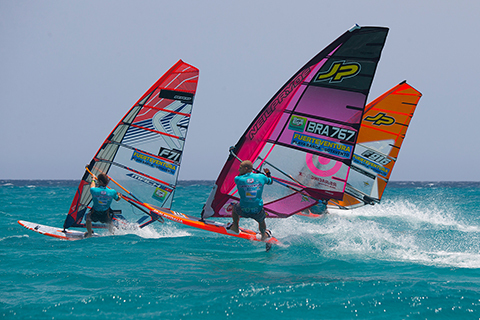 Sotavento is one of the best and also the hardest places in the world for slalom racing, you need a lot of experience there to get a good result. Sometimes it can be flat, sometimes choppy and wavy, but it’s always fun. As I’m taller than most of the other guys, I really need control and comfort in chop. Personally I use long harness lines with more space between each line and increase the stance between the footstraps for more control. I always use a 32 cm fin on my 90 litre Starboard Isonic, it may be slower but it has a lot of ‘grab’ and control. Off the water I focus on leg strength because we need a strong ‘sitting’ position to absorb the chop! In the gym I use principally my body weight and the “KO8 suspension and resistance training system”, working on my legs and coordination.